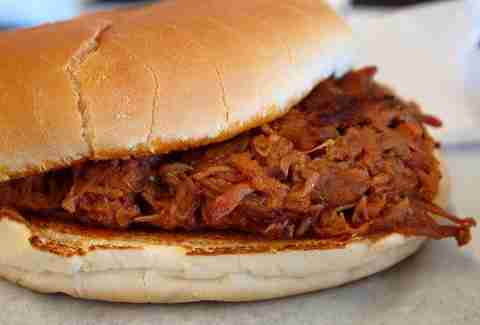 Stanley's is the oldest operating ma'-and-pa' BBQ joint in Tyler, serving up the same delicious pit-smoked BBQ for over 50 years. The brisket, baby back ribs, turkey, fresh sausage, and pulled pork are the show-stoppers -- but there’s something for everyone here, even the non-meat lovers. Just a few years ago they expanded the restaurant to include a full bar and feature weekly live local bands. Now you can scoot up to a table, pop open an ice-cold Shiner, and enjoy some music. In 1999, Kelly "Big Daddy" Duncan spotted the location and converted the old country store and gas station into this delicious BBQ destination. Since then, he’s been serving lean, tender ribs and the other requisite meats, cooked slowly and basted over mesquite, with a tangy flavor thanks to a layer of original sauce. Big Daddy’s has become a favorite destination for fisherman, bikers, sportsmen, hungry folks, and now you. There’s not much to do in Mt. Vernon... well, aside from eating some of the best BBQ in Texas at this restaurant. 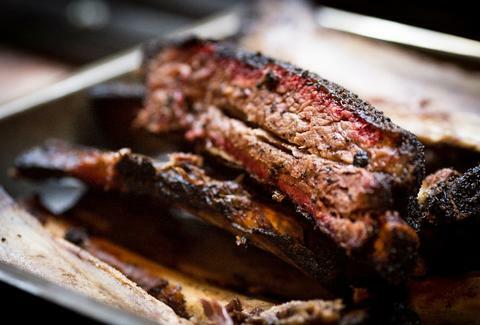 Brisket and ribs get the top billing, but it's hard to make a bad call. The big decision here isn't in what to eat; it's what to do afterwards. This predicament sort of recalls a movie based in a small Texas town where they're looking for something fun to do and then a guy with a chain saw... Wait. Nevermind. 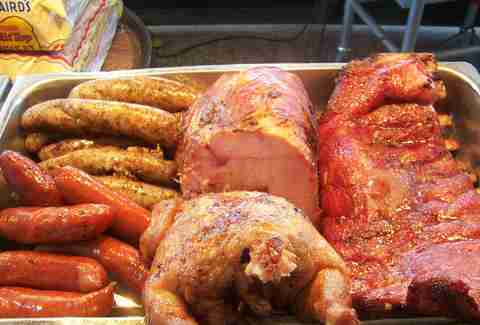 So, having exceptional meat is a BBQ establishment must, but sometimes the sides can really set a place apart. 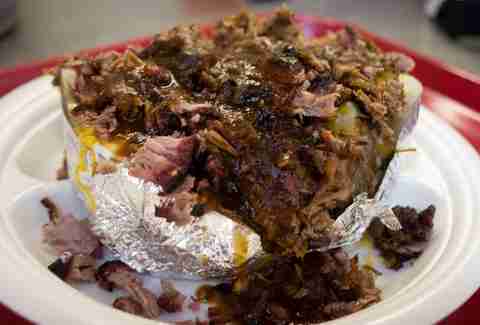 At The BBQ Joint, standout sides are the Texas Caviar and jalapeño potato salad, and definitely don't ignore the stuffed spuds, which live up to their billing both in terms of size and stuffed-ness. Bonus: it's not THAT far from Dallas, so you can use that extra gas money for... more sides! 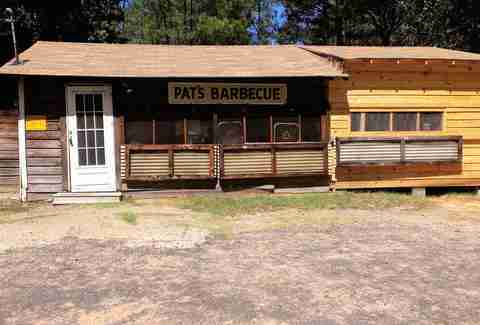 Just east of Tyler, lazily hiding underneath some old pine trees, sits Pat Gees. And behind Pat Gees? Nothing but pasture; well, aside from an outhouse. The Gee family has been churning out some of the best BBQ in East Texas from their smokers for the past 30 years, so it’s a given that their bringing it when it comes to the meat. The real differentiator in this place is how it unites meat lovers. Intimate folding tables greet you when you walk into the tiny wood-panel building, encouraging people from all backgrounds to eat their BBQ, family-style. Everyone is welcome at this table. Just wipe your hands and mind your manners. First of all, Longoria’s is in the middle of nowhere, which, depending on your situation, could be good or bad -- for BBQ joints it’s good. It’s almost as if no one wants you to discover their secret, which is partly true. The owners turned down an offer to be on a famous television show because they didn’t want to reveal the family’s cooking secrets. But that's okay, instead of trying to duplicate greatness we will just eat here. 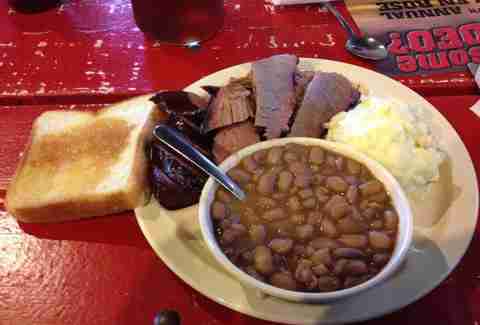 Try the three-meat combo with potato salad and beans. Glen Rose is known for its dinosaur fossils more than its BBQ, but Hammonds will change that for you. Started in 1966 by A.J. and Liz Hammond in their backyard, this spot quickly grew into two successful locations and perfected some of the best BBQ in Texas. 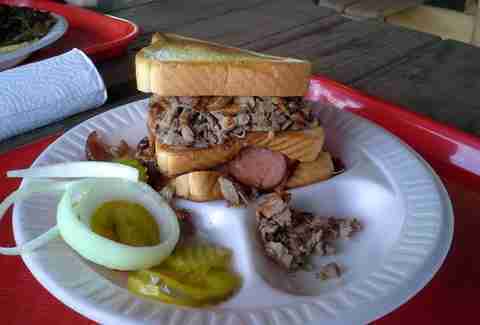 Order the mixed combo plate with three meats, two veggies, and Texas toast, and wash it down with an iced tea. Go see some T-Rex fossils when you’re done, or skip that and just watch Jurassic Park when you get home. 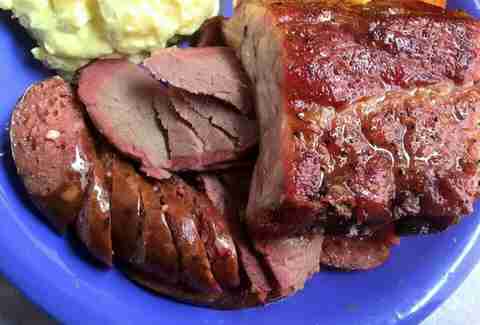 Besides having an awesome name, this family-owned-and-operated Sherman BBQ joint features distinctive meat, slow-smoked to perfection over Applewood. The ribs, brisket, and pulled pork are so insanely good they’ve even won a few awards nationally. But perhaps nothing is as rewarding as how full your belly will feel. You may even be tempted to oink. Please don't. Carter’s is a local haunt in Longview and a famous one at that. 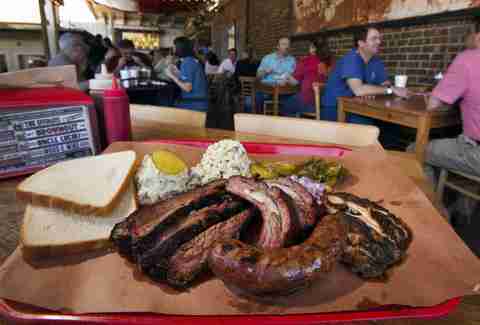 It could be the large portions, good prices, or ridiculously amazing pork ribs and sliced brisket. No one can really put their taste buds on it. The BBQ sauce here is also a big draw: slightly hot but mostly sweet. 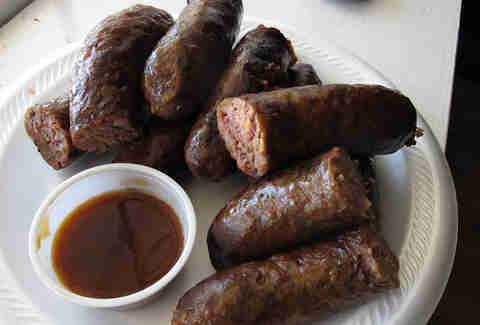 Insider tip: order the iced tea and try the boudin, a Cajun favorite (don’t forget, you’re practically an hour from Louisiana now).